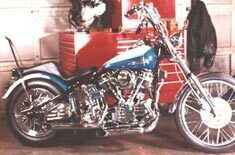 When you contact The CHROME LINK, you will be talking to a hands-on custom bike builder, not a telemarketing sales person. We have been in the motorcycle business for over 20 years and have over 50 years combined experience! We have the expertise, knowlege and ability to build a motorcycle as unique as the person who owns it. Whether it's an award winning showbike you want or the envy of your friends, we can make it happen! From mild to wild, if you can think of it, we can do it! Full Restoration to include Tank stretching, sheet metal work, custom parts, dashes, fenders, wedge raking, tubes. Harley is a trademark of the Harley-Davidson Motor Company and is used for reference only. We are not affiliated with the Harley-Davidson Motor Company. All product names, registered trademarks, and trademarks are the property of their respective owners. Contact webmaster with questions or problems with these pages.